To those of you who are celebrating today, I want to wish you a very Merry Christmas. I hope you are spending the day with friends and family, and the day is full of good cheer. With a 24/7 business like domain name investing, it is important to take some time off from working to enjoy life. Hopefully this means you get to spend some time with the people who are important to you. Merry Christmas to you and your family. Enjoy the day and the rest of the year. 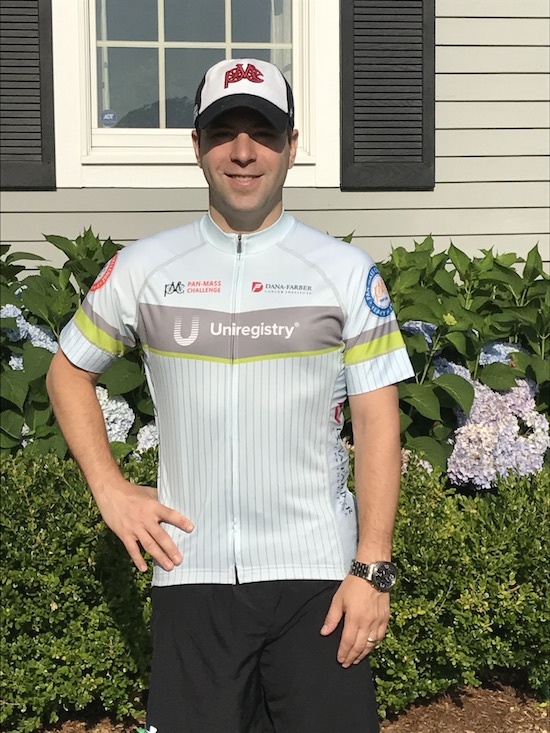 A little over a week ago, industry attorney John Berryhill and I rode the 163 mile Pan-Mass Challenge bike ride to raise funds for Dana-Farber Cancer Institute. Together, with the help of colleagues, friends, and family, John and I helped to raise nearly $20,000 for DFCI. John was filming throughout the ride and weekend, I want to share the video he posted yesterday. For those who are inclined, John and I are still hopeful to reach our fundraising goals. My PMC fundraising page is here and John’s PMC fundraising page is here. Have a look at the video when you have a chance. It was a great weekend for a great organization. Thank You to Our PMC Jersey Sponsors! Our 2017 Pan-Mass Challenge jerseys have arrived and they look great. With the help of several fantastic domain industry sponsors, John Berryhill and I have helped to raise over $17,000 for Dana-Farber Cancer Institute via our PMC fundraisers! My goal is to raise $12,000 and John’s goal is to raise $9,000, so we still have a bit of a ways to go before we can call this a complete success. Thanks to the following domain industry sponsors, John and I will be wearing snazzy cycling jerseys with the logos of domain industry companies who have sponsored our ride with donations of $500 or more. I would be remiss if I didn’t mention that we have had great support from others in the domain industry. This weekend, I will be doing two 75 mile training rides in the MetroWest region of Boston. I will be riding with a few other people who are also training for the Pan-Mass Challenge. 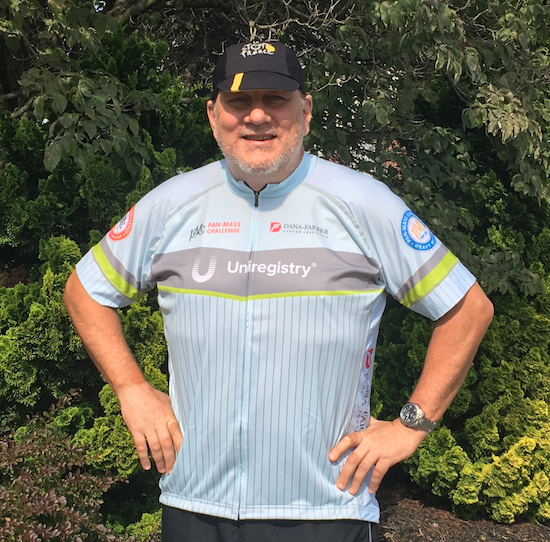 My bet is that I will be the only one wearing a custom jersey this weekend, and I will proudly tell the other riders why I am wearing the jersey and that it was a big factor in our fundraising. I am sure John will do the same on his training rides. 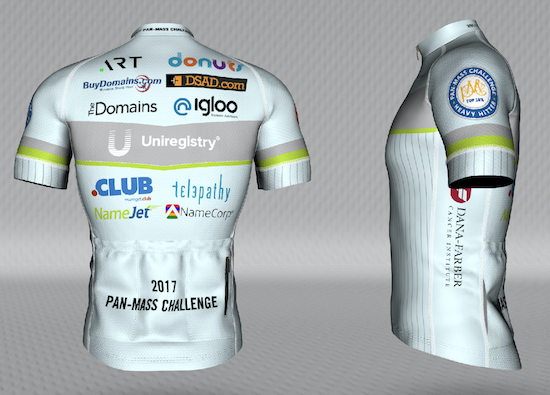 Our 2017 Pan-Mass Challenge jersey is almost ready! We need support from one additional domain industry sponsor, and John Berryhill and I will be ready to rock our cycling jerseys! A donation of $500 to Dana-Farber Cancer Institute in Boston via John’s PMC fundraiser or my PMC fundraiser will get your company’s logo on the back of our jersey. With your help, John and I have raised over $10,000 for Dana-Farber this year. Both of us have a bit of a way to go to meet our fundraising goal and could really use your support. Even if the jersey sponsorship is too much, a donation of any size will be appreciated. All of the domain industry support we have received so far has been amazing! There is room for two more logos on the back of the jersey, and since GoDaddy sponsored us earlier today, there a spot for ONE more industry sponsor’s logo! If you would like to be the last jersey sponsor for our ride, please post a comment so that multiple people/companies don’t donate. I would love to have more $500 donors, but the shirt will only accommodate one additional logo! There are going to be a couple of additional changes made to the jersey coloring, and I hope to have a final version by Monday afternoon! Update: .Buzz has sponsored our jersey! Get Your Logo on Our PMC Jersey! This year’s Pan-Mass Challenge ride is coming up the first weekend in August. John Berryhill and I will be riding 163 miles on our bicycles over two days to raise money for Dana-Farber Cancer Institute, one of the world’s leading cancer organizations. Last week, I wrote about the unique way John is raising funds for his campaign. If you haven’t read about it, check it out and keep the offer in mind if a domain name legal issue comes up. On the first day of the Pan-Mass Challenge ride, cyclists wear the official PMC jersey. On the second day of the ride, cyclists can either wear their PMC jersey or they can wear another jersey of their choice. 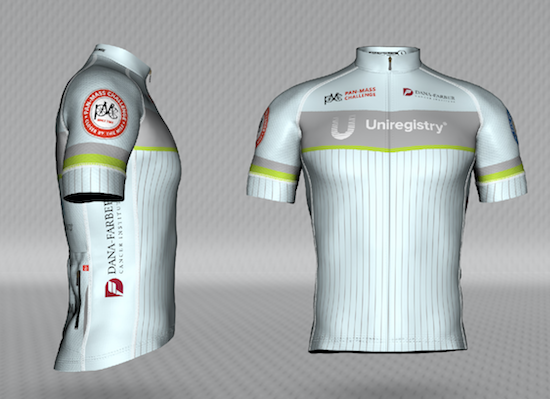 My preference has been to create my own PMC jersey with the logos of domain industry sponsors on the back. 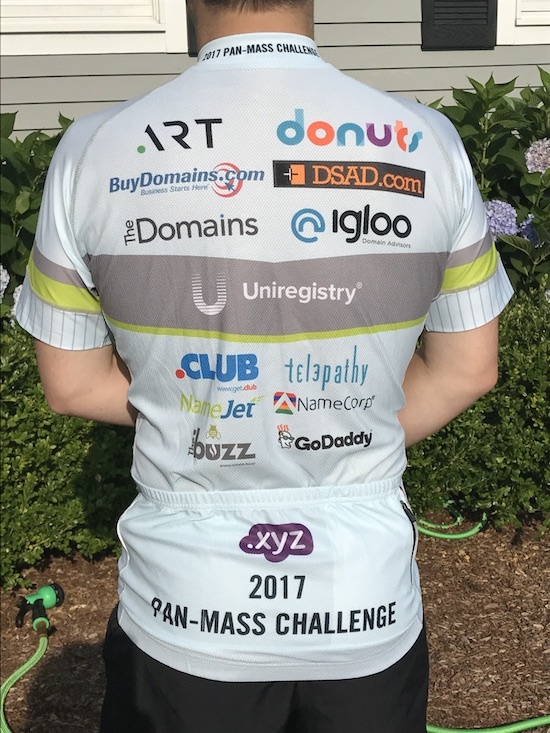 This year, John and I plan to wear a customized PMC jersey to thank domain industry sponsors for their support. We will also wear our jerseys on our final few training rides prior to PMC weekend. The first round concept of our PMC jersey is shown above. The only thing missing is logos on the back and maybe one large one on the front! There are either 14 or 15 spots available, and companies who donate $500+ to either John’s fundraising campaign or to my fundraising campaign will be honored with a logo placement on the back. 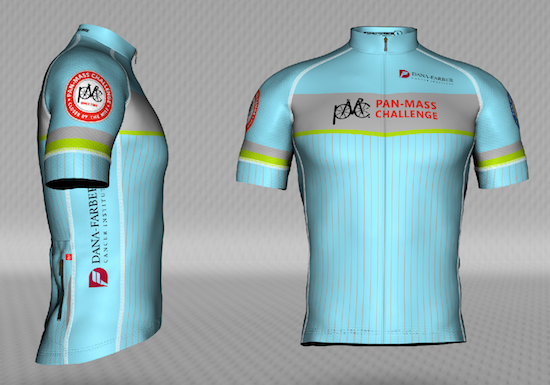 If one company donates $1,500 to to Dana-Farber Cancer Institute via one of our PMC fundraisers, their logo will be featured front and center on the jersey, below the Pan-Mass Challenge logo. Time is of the essence because I need to have the jersey design finalized by Friday to get them in time, so your logo will only be placed on the jersey if your donation is made by Friday and I have your logo by Friday (6/23/17). It would be awesome to have your support!